After being in the business for nearly 40 years, we have just about seen it all! 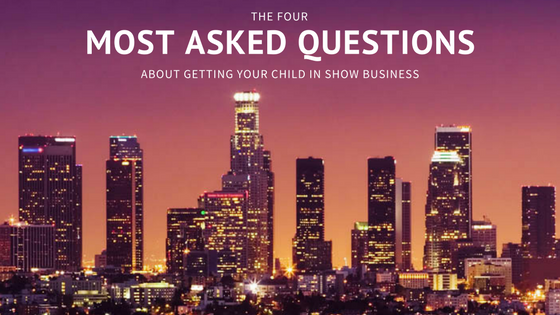 Here are the top four questions parents ask about getting their child in show business. What does an agent do? Why do we need one? Do I have to pay them up front? Agents are the folks who get your child the interviews for jobs (auditions), negotiate the contracts, and collect any money due to your child. Without an agent, not much will happen, your child will get paid little or no money, and your child may not have the studio teachers on the set as the law requires. Agents should never charge fees upfront; they work on commission only. Agents should not take money for classes, photos, or any other services. Do I have to make a portfolio, composite, or head shot of my child before submitting to get representation? You should have a good photo to submit to agents while you are seeking representation, but it does not need to be professional. You will not need to have professional photos taken until after you have found an agent and signed with them. Most agents will want to look at the proofs and chose the shots that they think will get your child the most auditions. Remember, an agent cannot charge you for photos, nor can they demand that you work with a specific photographer. They may, however, give you a list of photographers for you to chose from. An agent typically represents dozens-- if not hundreds--of kids. They focus on submitting headshots to get their clients auditions, and negotiating contracts once roles are booked. They have very little time for minute issues and they just can't give you the time and support that a manager can. Managers, on the other hand, usually only have a handful select clients. Managers can really help you and take away a lot of unnecessary stress and responsibility. Managers can be very helpful as they do more hand-holding than agents. They are the go between you and the agent. Like an agent, they also work on commission. Your child must have an Agent, but you don’t have to have a manager. Managers place your child with the Agent, and help you get photos, find classes etc. Most of your calls and interviews should come from your manager. Managers talk to you about interviewing, how to sign in on calls, books outs, flippers, classes, and more. Only agents can take bookings from casting directors, negotiate contracts, and pay and collect the monies from the Ad agencies. What are the busiest ages in the business? Because of the child labor laws in California, "Legally 6" and up is usually the busiest age-- especially if the 6 year old looks younger. Since 6 year olds can stay on the set longer than babies and younger children, production companies can get more "bang for their buck" if they hire them. For example, let's say little Johnny is 7, but he looks 5. His agent submits him for the role of a 5 year old in an upcoming commercial. He is up against several 5 year olds, but the production company can keep him on the set for 8 hours, where as the 5 year olds have to go home after 6 hours. Since actors are not paid by the hour, but by the project, Johnny has an edge over the 5 year olds. The production company can spend the same amount of money, but get 2 extra hours of work! Now, there are some roles that 6 year olds just can't fill, so there is plenty of work for babies and toddlers, too! Getting started in the Entertainment Industry can be overwhelming, but you don't have to go it alone. Who better to help you than a mom who has done it herself?! Phyllis Henson is one the first and only consultants parents can go to in order to get all of their questions answered BEFORE looking for an agent! Read about Ms Henson and her journey through Hollywood on our About Us page. As your consultant and advisor, Ms Henson can help you get in front of the agents who can start sending your child out on auditions. With her connections in the industry, it won't be long before your child is working in the entertainment industry! The services you receive from Kids Hollywood are unique-- where else does the owner and CEO talk to clients one on one? Even after your child is signed with an agent, Ms Henson will continue to answer any questions you might have and guide you through the maze that is Hollywood! Contact us now to find out more, and check out some success stories from our little stars!